"My name is Fatou, I am 32 years old I am of Senegalese origin. I had my pimples since the age of puberty. I used all kinds of products such as soaps, creams and lightening tubes. In short, I applied everything I was recommended because I was desperate. 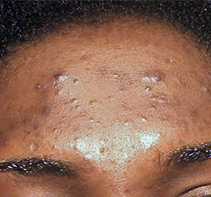 I saw a dermatologist twice, who gave me treatments and told me that it was hormonal. Indeed, as soon as I stopped the treatments, the buttons resumed. The doctors prescribed a pill I took it 6 months it was nickel I had more pimples but when I stopped they came back and I realized that I was going to depend on it all my life and I have stopped everything. I started applying scrubs and masks again and it burned all over my face. 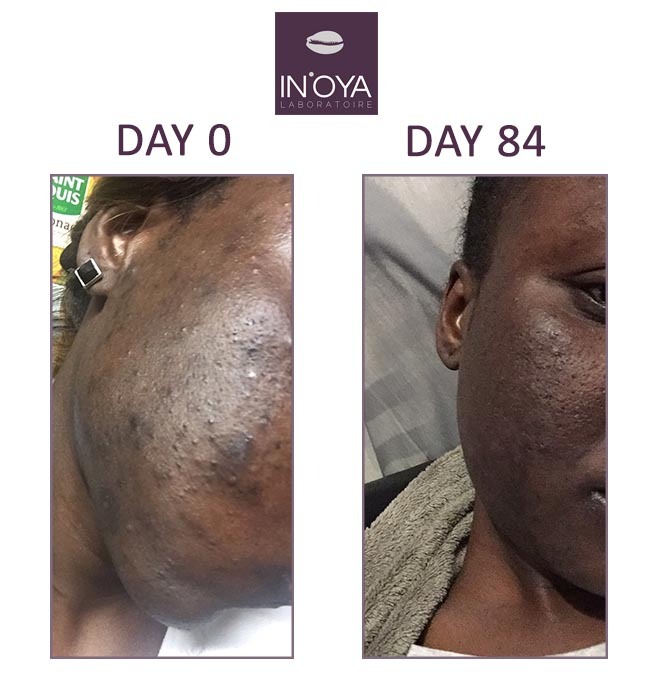 May 19, 2018 a friend advised me to use the products IN'OYA I was retouching at first but finally I started I went to the pharmacy to make a skin diagnosis I was told that I had 30% dry skin I took almost the whole range. From the first use I had a feeling of sweetness. My face has never felt so good because all the products that I had to use made me tingling effects, it seriously attacked my skin and there for the first time I did not feel anything I said to myself what I was looking for! After two months of use I began to regain my skin texture my face was illuminated day by day I started to stop putting on makeup because before I dared not go out without makeup. And there I felt better and better. Then, I stopped for a while. Then, one day while I was shopping on the site of IN'OYA I decided to participate in the OYA Program to win a full treatment. I put a horrible picture that showed the gravity of my situation. I was surprised to have been selected so I thought these people really trust their products. I then gained treatment for three months, received my order and started treatment. From time to time I sent pictures to a counselor who was watching my evolution and giving me advice and so on. I do not regret this experience at all I am completely satisfied with my result. I recommend all women to use IN'OYA products. I tell you no product has ever succeeded until I cross the path of IN'OYA. So for advice we must respect the process of use take the time to clean properly put the products as prescribed and keep good hygiene (use clean towels and only for the face). Apply the products with pleasure and I promise you that you will only be fully satisfied my ladies. Long live inoya, long live the black and natural beauty!"